Granicus is a third-party contractor that builds communication tools to help governments engage constituents online. The company offers services for social media, websites, and email, and it boasts of serving over 4,000 federal, state, and local agencies, from the city of Oakland to the U.S. Veterans Administration to HealthCare.gov. In 2016, the company merged with GovDelivery, another government-services provider. It appears that parts of the federal government have been working with GovDelivery, now Granicus, since at least 2012. Last October, we took a closer look at some of the emails sent with Granicus’s platform, specifically those from the whitehouse.gov mailing list, which used the GovDelivery email service until very recently. The White House changed its email management platform shortly after we began our investigation for this article. However, several other agencies and many state and city governments still use Granicus as their mailing list distributors. Other government agencies still use Granicus, such as the Department of Veterans Affairs’ “My HealtheVet” newsletter, the Social Security administration, and HealthCare.gov Alerts. 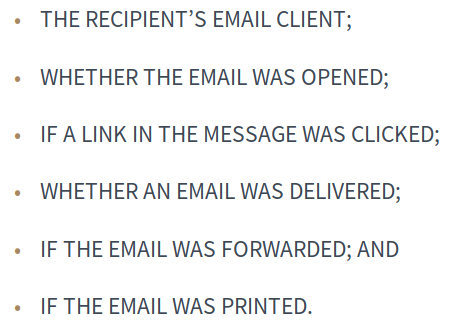 These mailing lists all perform the same kinds of link shimming and pixel tracking we observed in the original White House emails. Some of the emails we’ve received from Granicus use HTTPS connections to perform tracking, but others still use insecure HTTP. And the company still does not support outbound server-to-server email encryption with STARTTLS. Unfortunately, many federal agencies still use Granicus’ services, dubious security and all. These agencies should drop GovDelivery in favor of more ethical, more secure analytics, and evaluate how much information they really need to collect to fulfill their missions. Although the White House is no longer using Granicus, it, too, performs extensive tracking on subscribers to its lists. And the only way it offers to opt out is to unsubscribe. Like the world’s other leading email platforms – including several other email systems used at the White House – we do use pixels to track open rates and link shims to track click rates. This is an industry standard that has been in use for over 20 years. It’s used by virtually every major commercial and public sector communicator to track simple email opens and link clicks. It is worth noting, that Granicus govDelivery is configurable, allowing customers to turn off activity capture. NEXT STORYIf Yellowstone erupts where should I go? What will happen? Why should I be worried now?